Umbra Winery is a Texas winery based in Springtown, Texas. Our urban tasting room is located at 415 S. Main Street in Grapevine, Texas. The original winery, Crossroads Winery, was established in 2005. After purchasing Crossroads in 2013, owners John and Debbie Wilson shortly thereafter rebranded to Umbra Winery and opened their Grapevine tasting room. In 2016, they purchased La Buena Vida Vineyards, the third oldest vineyard and winery in Texas and relocated all production there. The grounds boast 7.5 acres of established vines, quaint cottages and a newly constructed 8000 sq ft event center, complete with tasting room and estate wine cellar. What and Who is Umbra? The astronomical definition of umbra is “the completely dark portion of the shadow cast by the earth, moon, or other body during an eclipse”. The Umbra logo is essentially the image of two heavenly bodies that meet and while scientific, is also quite beautiful. Wilson, a chemical engineer by education, rebranded under the Umbra name in 2014, citing the name was selected as it represented the coming together of he and his wife and this endeavor. Wilson adds a fresh view that has expanded operations to Grapevine and exposed Umbra’s wines to a larger audience with retailers such as Market Street and Kroger. Umbra produces several wines, Honey Mead as well as estate wine offerings from the vineyard in Springtown. Mead is an ancient form of wine made with honey and appeals to wine and beer drinkers alike. Their offerings include award winners such as Umbra Pinot Gris that won Gold in its class at Houston International in 2014. The Cabernet, Syrah, Merlot blend known as Red Fusion also placed (bronze) at Houston International, won second in the Red category at GrapeFest (2014) and bronze at Texsom 2015. Both wines are distributed to retail outlets such as Tom Thumb and Market Street with more added monthly. In 2016, Umbra added a selection of imported Old World Wines to their offerings to provide guests a wider array of choices when visiting the tasting room. These offerings are carefully selected from boutique wineries to showcase varietals from those countries. Pairing with the Eurostyle tapas menu, it is a natural fit for Umbra Winery. They also offer an array of fun, fruity Champagne Cocktails! During the holidays, you’ll find the aroma of mulled wine wafting about and in the hot Texas summer months, the winearita machine and freshly made Sangrias will keep you cool and satisfied! Umbra Wine Club is a fantastic way to experience Umbra wines all year round! With exclusive perks such as previews of new releases, special events, trips and more, it makes a great gift for yourself and others. Wine club members receive 2 bottles of wine every other month (Winemaker selection). Click here to download the application and learn more about the wine club member benefits. 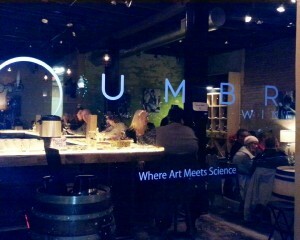 Winemaking is truly both an art and a science and Umbra blends the two in all we do. There is a distinctive cool, yet relaxing European vibe in the tasting room reminiscent of some of the urban Enotecas (wine bars) found in and around Italy or Spain. The uplit bar created by Luminexa, is a beautiful golden ray of colored stones, adding a warm ray of “sun” to the room. See the La Buena Vida Vineyard tab for details on that location, just 45 miles from Grapevine! The menu created in concert with Italian Chef Domenico showcases some traditional tapa favorites that pair well with Umbra wines. From the delicious Bruschetta to the Chocolate Board, there is something for your fancy. The décor includes photo art of some well-known Italian actors back in their hay day – maybe you can spot who they are! The European element is a familiar feel for Wilson and his wife, Debbie. She spent many years living and traveling in Europe, and he is of Sicilian and Irish descent. When the two honeymooned in Chianti and Tuscany in 2013, the concept for Umbra was born on a rooftop bar beside the Arno river, overlooking the lit up Duomo in Florence. The bar was abuzz with beautiful Italian people and the air was filled with music the two had never heard. John knew this music must be one of the hallmarks of Umbra. “If we want people to feel as if they stepped off the street of Texas and entered an enoteca in Firenze, this music will be a big part of that” John had commented to Debbie. Coincidentally, it’s only fitting that these two met at a wine tasting…the rest is history! The tasting room displays an array of wines that may be purchased by the glass, bottle or case. They also offer tastings and flights to enjoy with friends. When you come to Umbra, the couple wants you to experience a relaxing time enjoying great wine, delicious food and wonderful friends, be they old or new! For without any of these things, life would be a lot less fun, don’t you agree? Cheers!